Thanks Jules for teaching me and helping me pass my test. 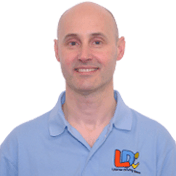 I found Jules Baines to be an excellent driving instructor throughout my time learning to drive with him. 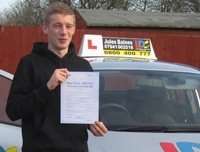 He was very calm, patient and easy to talk to which made it a much more enjoyable experience whilst learning to drive. He explained things fully and took his time making sure that I understood what I needed to do and I didn't ever feel I was being thrown in at the deep end. He also demonstrates and shows you step by step what you need to be doing. If at any point I had any questions he was more than willing to answer them. I would rate the LD System of tuition he uses highly as it teaches you so much just by reading it. It explains in depth about all the aspects of driving you'll be doing whilst learning to drive with Jules. It is also an excellent way to keep track of your progress and shows you what you need to improve on and what your strong points are. I found the DVD’s very helpful as I learnt so much of the theory from it which in turn helped me pass my theory first time round. In the lessons leading up to my test he allowed me to practice the things that I felt I needed to improve on, and also doing some of the test routes and independent driving which comes up in the test. I found this extremely helpful. I'd rate Jules as an excellent instructor who supports you every step of the way. I found the driving skills workbook and theory DVD’s to be essential as they both helped me to learn the fundamentals of driving. I would definitely recommend Jules. I successfully passed my test first time with only one minor! Thank you very much for teaching me to drive and good luck in the future.